The Pacemaker was a pretty sophisticated camera, it had a real shutter release button and a connector for the Graflex 3-battery flash. Those flashes are near impossible to get these days, it turns out they were the original props for the light sabers in the Star Wars movies of the 1970s and 1980s and since the second series of films was made (and the internet had been invented), Star Wars fans pay huge amounts for a 3-cell Graflex flash. More cash for the non-working flash than for the excellent camera, would you believe it! The metal key winds the shutter, the very little switch at the very bottom changes the spring tension and as a result you can have 30/50, 125/250, 500/1000 shutter speeds on the focal plane shutter. Or leave the cloth shutter open and use the shutter on the lens, if your lens has a shutter at all! Don't worry about the paint flaking off, it still works just fine and that's what matters most, right? These cameras with a lens mounted can be heavy and I use an old Bilora Video Head to set them on a tripod, since it has a very big mounting plate and can support the camera and part of the lens bed. This is a 'view camera version' of the Anniversary Speed Graphic, with the Kalart rangefinder removed. 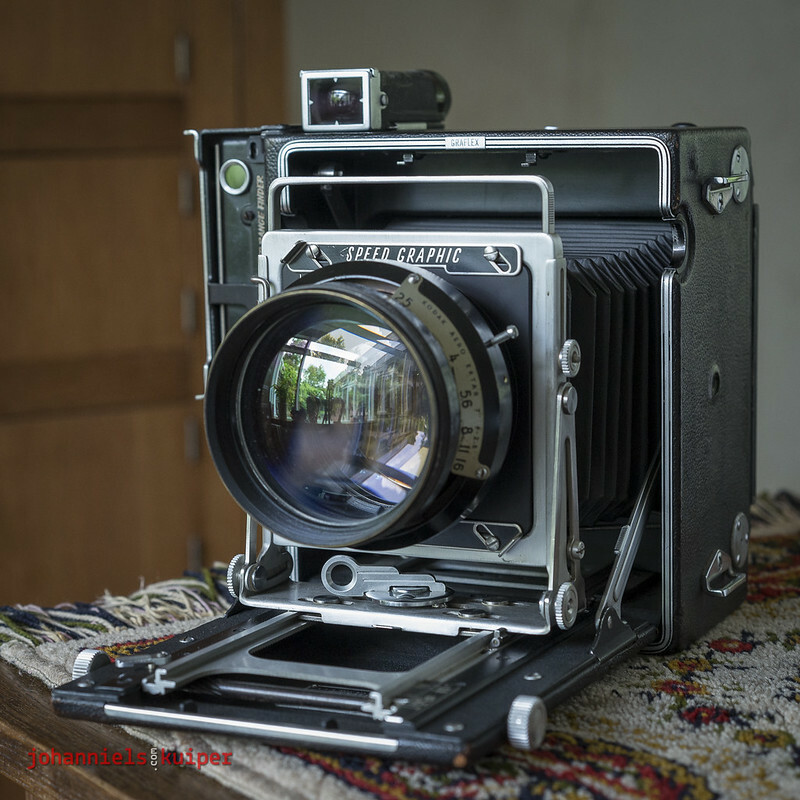 Focusing is on the ground glass! The Anniversary Speed Graphic has a somewhat arcane way of setting shutter speeds: it works with a combination of spring tension (set with the smaller dial below, the chosen tension shows in the small circular window above) and shutter slit width, set with the values 'A' through 'D' with the bigger key at the top of the camera's right side. See previous image for that one. American photographer Dave Burnett shoots a Graflex Pacemaker Speed Graphic with the desirable Kodak Aero-Ektar 178mm 2.5 lens on it. The Aero-Ektar was developed by Kodak for use in American bomber aircraft during world war II. The lens was big and heavy, and built into a camera that recorded bombing results on the ground. If you ever saw a picture that showed what German cities looked like after a bombing raid, chances are that it was shot with an Aero-Ektar lens. After world war II, many of these lenses were sold for little money at army surplus stores and throughout the 1940s and 1950s large format studio photographers used them as portrait lenses with shallow Depth of Field on their Pacemaker cameras, which were mounted on a tripod. In the last decade they have become desirable again, especially when a few years ago the 'bokeh' hype for 135-format cameras caught on. People looking for the best quality of unsharpness in their images (that is what the Japanese word 'bokeh' loosely translated means) soon found out that the best quality of unsharpness was in large format lenses and they took to shooting 4x5 inch and larger negatives. Dave Burnett uses the combo that on the internet was named after him on a tripod as well, but also without any tripod support. And, he takes his combo with him to shoot remarkable images at the Olympics! For most people who are new to Graflex, the big issue is how to differentiate between the different camera backs. Because, not all accessories fit all backs and you want to make sure you get the accessory that you can use on your camera model! The Spring back is the kind of back that is permanently attached to the camera. It has flat leaf springs on top and bottom and no chrome sliders to mount accessories. Sometimes Spring backs have an option where you can remove the hood that sits over the ground glass, but the springs are permanently attached to the camera! Both cameras shown above had Spring backs. The Graphic back is the kind of back that can be removed from the camera. It has the clamp-style springs (they are pronounced and look like hooks) and it does have chrome sliders to mount accessories. These Graphic backs almost always come with removable hoods over the ground glass (like the Spring backs sometimes have) but with the Graphic back, the springs are not permanently attached to the camera!